A few days in Chennai, in a magnificent hotel, with an old friend from my days in Savannah was a nice way to almost end 2013. We were back in Bangalore for New Year’s Eve. True to ourselves, we didn’t do the typical tourist tour, and E. had some meetings to attend. I didn’t visit one temple while in Chennai, though there are many, nor did I go on a search for the perfect Madras silk. I will do that at a later date, after I have done some thorough research on the topic. I am tired of being charged tourist prices on everything! The hotel lobby was decorated in grand style, with a huge Christmas tree at the top of the massive marble staircase that pales in comparison to Tara’s in Gone with the Wind. 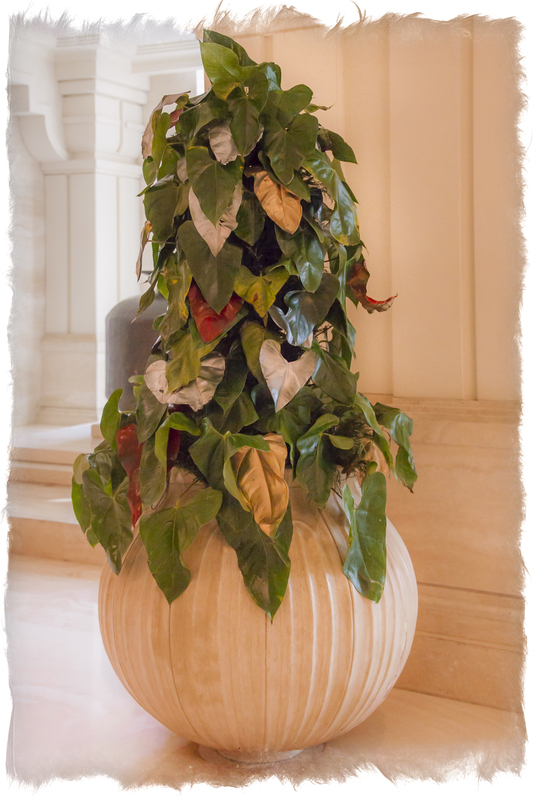 They didn’t limit themselves to adorning a pine tree, they spray-painted the leaves of most decorative trees in the hallways. We went for a long walk around the hotel, off the beaten path, under the dangerous electrical contraptions, over the ubiquitous smelly sewer, next to the golf course where the attendants wanted to know what E.’s handicap is, in front of the sleeping tuk-tuk drivers and sick dogs, next to the two guys who wanted pictures taken with us, in front of many little stalls where people invariably gave us huge smiles and always responded to my waves. Then we went to the Indian Ocean. But first let me tell you about our driver in Chennai that day. His name was Bagini and was in his 20’s. He didn’t speak English. Oh, were we in for a treat. And his driving skills were, let’s say, less smooth than what we have been accustomed to. A speed hump? No problem, slam on the brakes. A cow? Slam on the brakes. Need to turn right at this very instant? Slam on the brakes. The poor guy had no idea where we wanted to go. He probably thought he was getting a customer who simply needed to be driven to his office building, or a well-known fancy restaurant in town. 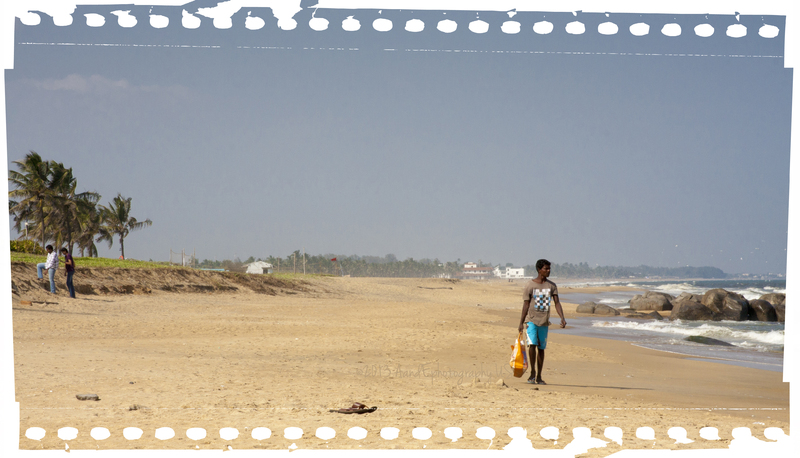 We wanted to go an hour south of Chennai. He kept stopping (after slamming on the brakes) to ask for directions. After a few wrong turns and translation mishaps (“lefsah?” means “Sir, should we make a left?” as in “Left, Sir?”), E. got his phone out and thanks to Google maps, we got there! But we first drove through the Catholic mission’s courtyard, someone’s backyard I think, and few parking lots. We saw lots of goats too! We spent a few hours in Fisherman’s Cove, a name reminiscent of Fisherman’s Wharf in San Francisco though they couldn’t be more different. Fisherman’s Cove is, you guessed it, a place where fishermen fish. And where they built a nice hotel. It was my very first time at the Indian Ocean, and I got choked up. The sand here is not white but brown, the water is not turquoise but dark blue, the main trees are not palms. But it’s serene. Aside from two hotel guests, no one was in the water, nor sunbathing (half)-naked on a beach towel. The currents were very strong and we heard someone with a whistle seemingly asking a bather out of the water. It’s time we turn our house into a home, so we bought wall hangings at a crafts festival. But we can’t hang them. In India, all walls are made of concrete and cinder blocks. You can’t hammer a nail into cinder blocks, or you need a special drill. Amazon will soon deliver 3M Command hooks. We saw lots of interesting crafts, some more unusual than others. And there had a dance performance that we caught mid-way. Saris were flying and twirling, feet pounding the sand, tons of make-up on the dancers, and surprise, hijras. 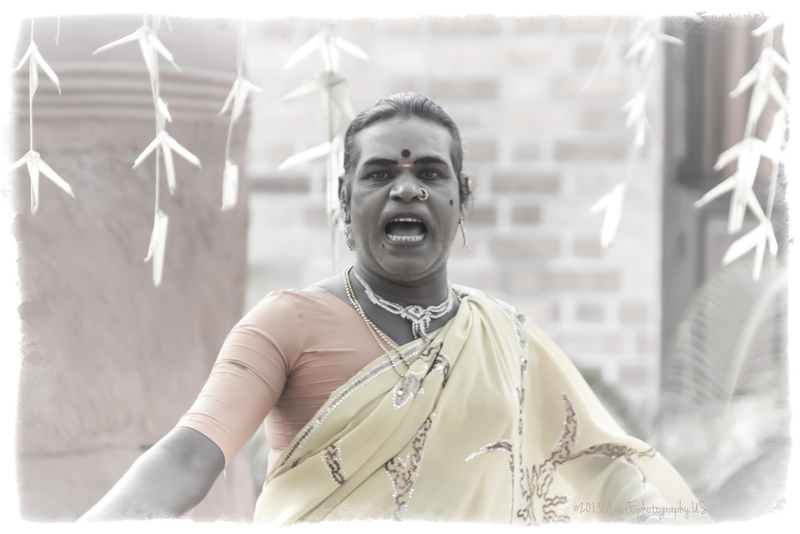 Hijras are men who dress as women. It would be simplistic to compare them to transvestites or transgendered as there are many categories of hijras. Let’s just say that some big men dressed in saris, with long braids adorned with flowers and full jewelry were singing and dancing. The next day at the airport, in the security line for women, I was in line behind a hijra. Aside | This entry was posted in Street photography, Tourism and tagged Chennai, Christmas, dog, expat, Fisherman's Cove, hijra, India, Indian Ocean, ITC Grand Chola, Madras, street photography, tuk tuk. Bookmark the permalink.